In some cases a client may have a concern about their pet, or an emergency issue/situation and want a Vet to see them as soon as possible. If we cannot accommodate you regarding an appointment time, it is possible to immediately admit your pet for the day, or what best suits you. This allows us to begin therapy sooner if your pet’s medical condition warrants it. 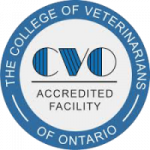 Clients will [normally] have their pet assessed by an RVT as the initial evaluation, and in order to fully complete the drop-off history and consent form required. [Provided below] This is called triage and must be completed before your pet is admitted to the hospital for a Vet exam. Our Veterinarian will make a quick assessment in-between her/his appointments based on the information gathered, and direct the Technician to begin some emergency therapy (IV fluids etc.) and start diagnostics early (blood/urine analysis). There is an consultation fee associated with this service.